We went up for the beginning of Snodeo . As we drove up the road we wondered if there would be enough snow. There wasn't any question when we got there. The Diamond Pond area is a whole different climate. They are still buried in snow and more was falling! Click here to see a panorama of some of it. March 3rd and 4th: 7th Annual Sno-Deo at Coleman State Park in Stewartstown, NH by the Swift Diamond Riders Snowmobile Club . It is accessible by car (Off Route 26) or snow machine (Off Corridors 5 and 18). Now that we have plenty of snow the Great North Woods has become THE place to be this winter! Be sure to check the Lodging section to reserve a room! Snowmobiling in the Great North Woods on February 6, 2000. This is on the old Kilkenny Railroad trail in Lancaster next to a beaver pond. There's a fellow in the background having fun on the ice on his ATV. The folks on ATVs "clearing the snow" on the beaver pond in Lancaster. The Kilkenny mountains in the background. Leaving the beaver pond to head off on the trail. Perfect for snowshoeing too! The snowmobile trails make it easy to get to the "outback" where you can then strike off to the real boonies. The webmaster (me) after an afternoon of snowshoeing and picture taking. The lawn chair makes getting in and out of the snowshoe bindings easier. That type of binding (racing bindings) gives you better control of the snowshoes. They are a pain to get on and off though. The evening (and night until 3:30 AM) after the picture on the right was taken I finally got the 1999 Blessing of the Bikes done! Click on the link or the picture to check it out and see why the folks below are smiling! On February 6th we have probably about two feet of snow. The snowmobiling, snowshoeing, ATV riding and skiing are GREAT now! Below is Cyndy clearing snow as some of the artificial wildlife looks on. More artificial wildlife strolling in the snow. A few weeks ago I stumbled on a rare book about Camp Diamond on Damond Pond. I toiled all weekend scanning it in and OCRing for your enjoyment. While the contents of this book aren't everyone's "cup of tea", many of you will be taken with it. Click here or on the title to the right to go to the beginning. They have snow over in Dummer! A cross country skiier enjoying it next, below. It was mighty cold out, but the citizens of Lancaster turned out for the last chance at a group picture in the 20th century. I believe that's Jill Brooks in the window of the second floor of the Lancaster National Bank taking the picture. The Famous iron horse looking over the scene. Later on the eve of the New Year there was a skating party at the rink in the park next to the Congregational Church, scrabble battles in the library and an art show at the Main Street gallery. Gina Hamilton, Executive Director of the Lancaster Main Street Program in the Gallery. The paintings and sculptures created by local artists are available for perusal and/or purchase at the gallery. A cozy fishing shanty (or bob house) on the Pontook. These two books are perfect companions. I highly recommend getting both and reading them together. Paul Doherty has about 80 copies left of "Smoke From A Thousand Campfires". It's out of print, so when they're gone, they're GONE. He's willing to sell them for just $50 plus $2.50 for postage. The 440 page illustrated hardcover book has already become a collectors' item. The first edition sold out in 6 weeks. The bookstores didn't get any until it was reprinted. You can send a check to: Paul Doherty at Box 271, Gorham, NH 03581. Just for the heck of it, tell him the guy with the Great North Woods web site sent you to him. If you ask real nice, he might even be convinced to autograph a copy for you! Spiked Boots is in print again! This is a great tale of the river drives and other interesting stories in the Great North Woods of Northern New Hampshire! Flash! 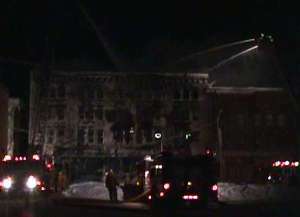 01/28/2000 - A major fire in downtown St. Johnsbury, VT. Click here or on the picture below to see more. If there are storms or other natural disasters, that interrupt one server, try the other. This winter could be interesting as there will be a solar cycle peak. Folks from Lancaster gathered on Main Street on the last day of the last millenium for a group picture.